Braintree gives your app or website a payment solution that accepts just about every payment method with one simple integration. Plus, we’ll give you your first $50,000 in transactions fee­-free. To learn more, visit Braintree­payments.com/twist. Jason begins the show by introducing this is as a special jam session episode, where founders get together and share information and jam on ideas, concepts, tools, tips and tricks. Jason does this in his LAUNCH Incubator. 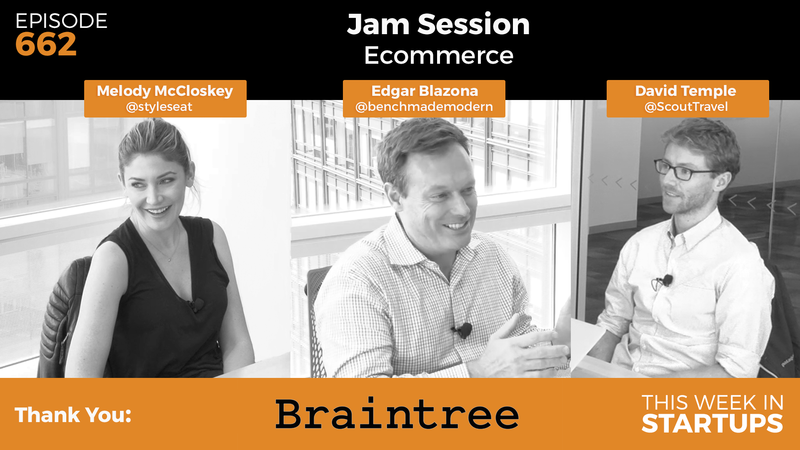 This jam session is about e-commerce–selling products, transactions, and how that all works. Jason selected the guests for this episode by looking into his portfolio and seeing who is over-performing, and who’s involved in a transaction. Leveraging data is a topic that is different for everyone. Melody mentions a couple of ways that StyleSeat uses data. StyleSeat is the largest destination to discover, book, and pay for appointments with salons and spas in the U.S. The big challenge is that stylists don’t have an easy way to run their day-to-day. That’s what StyleSeat does for them. They are a back office tool for them to do everything from client acquisition, giving them a website, power online booking, payment support, and almost double their revenue in the first 15 months. There are 3 different factors that StyleSeat looks at: geography, service type, and business size. How they optimize CPC advertising via segmentation and landing pages. BenchMade Modern makes custom by-the-inch sofas in as little as 24 hours. It takes a customer about 10.5 sessions on average to complete the conversion (purchase). It’s about a 14-day cycle from the initial visit to the purchase. Micro-conversion is a term Edgar’s team came up with, because it’s a long sales funnel. They created points within the sales funnel that describe those different steps, such as getting the customer to visit the product page, ordering a swatch kit, requesting a printout, and eventually purchasing a sofa. Edgar shows us some targeted Facebook ads and custom landing pages for customers, and the synchronicity between the two. He shows us his process of alleviating the stress in buying a big ticket item. Edgar also shares how he made a deal with Roman Mars to trade sofas for an ad on 99% Invisible, and offers advice for other startups to use the tools that they have to create different avenues. When we typically think of e-commerce, we think of a balancing, a cost of acquisition, with the lifetime value of a customer, driving digital marketing, advertising, and what we’re getting back on the other side. Hello Scout is an early stage company that focuses on travelers. It is a messaging app that connects travelers with tours and activities. To get feedback and ideas to inform the product going forward, David and his team took a street team approach and decided to go out and manually push customer conversions through the funnel by going to places they knew travelers would be. From there, they partnered with boutique hotels and also gained access to traveler data. David also shares his lessons learned, such as how testimonials on landing pages can be valuable. When asked what their worst moment in running your business, Melody discerns that to be an entrepreneur, you have the intellectual challenges of trying to learn, and manage a team, run a business, but there’s also the emotional challenges that people don’t talk about as much. The other day, Edgar tweeted out, “Being a CEO is much harder than you think.” He imparts advice of knowing your numbers when meeting with an investor, because they will ask. 00:52-04:15: Jason introduces the topic of e-commerce, and his guests, Melody McCloskey, David Temple, and Edgar Blazona. 06:32-16:17: Melody McCloskey of StyleSeat is first up with a slide deck on leveraging data to drive growth and engagement. 16:18-19:40: Jason follows up with a few questions for Melody on when she started thinking about her business from a data perspective first, as opposed to anecdotal evidence from customers, and how she confirms her hypotheses, and finds the right “Aha moments” for the next phase of testing. 19:41-23:20 : David Temple asks Melody how much she used market data from research to decide which metros were good versus launching things in a trial way and seeing what worked. 23:21-32:00: Edgar Blazona talks about micro-conversions to a big ticket sale. 32:01-41:51: The group follows-up with a questions about the funnel concept, how Edgar technically sets up retargeting, and costs per click. 52:30-56:23: The group goes around the table and asks some questions of their own on David’s topic.